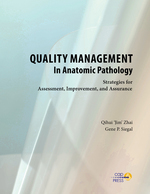 Quality Management in Anatomic Pathology: Strategies for Assessment, Improvement, and Assurance is the only comprehensive manual designed to improve patient care while ensuring your laboratory achieves its accreditation standards. It provides pathologists and lab directors with the tools necessary to develop, implement, and maintain a comprehensive quality program, with an emphasis on regulatory compliance and cross-references to the CAP Laboratory Accreditation Program checklists, Joint Commission standards, and CLIA ’88. Contents include general approaches to quality management, including designing a plan, defining and preventing errors, and plan components and monitors; systematic approaches to quality assurance in histology, intraoperative consultation, cytopathology, autopsy, immunohistochemistry, and molecular pathology; informatics, ISO 15189, and specimen tracking systems; and damage control and legal issues.